At WAKIKI we ensure the cooked and prepped foods are properly looked after. We are able to provide specific allergen information upon request. However, due to the complexity of some of the dishes, there may be reduced levels of the following allergens: cereals containing gluten; crustaceans; eggs; fish; peanuts; soya; milk; nuts – almonds, hazelnuts, walnuts, cashews, pecan nuts, brazil nuts, pistachio nuts, macadamia nuts; celery; sesame; sulphur dioxide and sulphites; lupin; molluscs. We aim to offer as much support for your dietary needs. Simply ask and we aim to do our best to cater to special dietary requirements. Only the freshest ingredients make the cut! And in every possible instance, our chefs select healthier substitute ingredients without compromising on taste. African and Caribbean cuisine relies heavily on nature for fresh ingredients. This, along with the spices and herbs offers a unique taste to each dish. With our chefs, caterers and suppliers on the same page, you get the same natural ingredients and taste. Receiving the full benefit of fresh ingredients, expertly prepared is what WAKIKI is all about. Natural ingredients properly handled and cooked. Flavours and aroma to die for. More importantly, nutritious food which leaves your body nourished and your senses thoroughly satisfied! Our groceries are sourced by our reputable and trusted partners, like our chefs, WAKIKI team works hard to ensure we only work with partners which share our values for QTIP – quality, timeliness, innovation and professionalism. The taste of the pudding is in the eating and with top range ingredients, authentic taste delivers each time. ‘Carefully curated’ is a phrase we take seriously and our food-loving chefs continuously strive to deliver perfection time after time. With our packaging crafted from the degradable material is readily recycled bringing love and care to the planet! Colours, flavours and textures, easy to eat food which offers children the love to eat WAKIKI’s food. 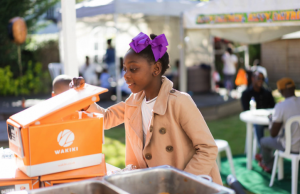 Wakiki helps their taste buds explore new tastes as they adventure with African and Caribbean dishes at home. The rich blend of spices, the array of vegetables and authentic cooking styles, all in one place. WAKIKI brings the community, culture and essence of mouth-watering Afro-Caribbean cuisine to your table at every occasion! Our prepped range is – go and ‘turn up the heat’ and you’re all set. Chopped vegetables, marinated meats, lovingly treated ingredients ready for you and flavours arrayed simply … turn up the heat!